Niantic, Inc. is an American software development company based in San Francisco, which is best known for developing the augmented reality mobile games Ingress, Pokémon Go, and the upcoming Harry Potter: Wizards Unite. The company was formed as Niantic Labs in 2010 as an internal startup within Google. The company became an independent entity in October 2015. The company was formed in 2010 by John Hanke as Niantic Labs, an internal startup within Google. The company took its name from the whaling vessel Niantic, which came to San Francisco during the California Gold Rush in the 1800s. At the time Ingress was launched, Niantic had 35 employees. The company spun out of Google in October 2015 soon after Google's announcement of its restructuring as Alphabet Inc. During the spinout, Niantic announced that Google, Nintendo, and The Pokémon Company would invest up to $30 million in Series-A funding, $20 million upfront and the remaining $10 million in financing conditioned upon the company achieving certain milestones, to support the growth of the company and its products. In February 2016, Niantic announced that it secured an additional $5 million in Series A funding including investment from venture capital firms Alsop Louie Partners and You & Mr. Jones Brandtech Ventures, as well as angel investors Lucas Nealan, Cyan Banister, and Scott Banister. While adding more support for the growth of the company, this investment enabled Niantic to bring in strategic industry pioneers including the addition of Gilman Louie to its board. In November 2017, Niantic raised $200 million in Series B funding from multiple investors, led by Spark Capital. Spark's Megan Quinn joined Niantic's board of directors during this investment round. In January 2019, it was reported that Niantic raised an additional $245 million in a Series C fundraising round. The round was led by Institutional Venture Partners (IVP), but also included investments from strategic partners such as AXiomatic Gaming and Samsung Ventures. In November 2017, it was announced that Niantic acquired Evertoon, an app which allows users to make short, personalized films. According to the company’s announcement, the acquisition is meant to help build social systems. At the time of the acquisition, Evertoon was only 18 months old and had only 5 employees. In February 2018, Niantic announced that it had acquired augmented reality company Escher Reality, a team focused on building persistent, cross platform, multi-user experiences. Hanke stated that Niantic planned to allow third-party developers to build AR games similar to Pokémon Go. In June 2018, Niantic announced the acquisition of computer vision and machine learning company Matrix Mill. The Matrix Mill team has spent years focusing on perfecting augmented reality occlusion by building deep neural networks that can infer 3D information about the surrounding world. The acquisition significantly advances Niantic's efforts to deliver planet-scale AR and provide even more realistic AR experiences. In July 2018, Niantic announced the acquisition of LA-based gaming studio, Seismic Games. Composed of industry veterans from EA/Pandemic and Activision, and best known for co-developing Marvel Strike Force, the addition of Seismic Games to Niantic significantly accelerates their ability to deliver all new AR experiences that continue to bridge the physical and digital worlds. In November 2018, Niantic invested in DigiLens alongside Mitsubishi Chemical's Diamond Edge Ventures. The investment will help DigiLens develop holographic waveguide displays for augmented reality applications. In June 2018, Niantic shared a sneak peek behind the technology they have been developing for years: the Niantic Real World Platform. The core platform consists of a suite of tools including: AR Cloud, anti-cheat security, POI data, IAP, social, analytics, CRM, sponsorship, and more. Niantic mentioned that they intend to open up the platform in the future for use by third party developers. In December 2018, Niantic announced their Beyond Reality Developer Contest offering third party developers an opportunity to develop a new game experience on the Niantic Real World Platform for a chance to compete for a prize pool of more than $1 million. Niantic's first product, published in 2012, was Field Trip, a location-based mobile app which acted as "your guide to the cool, hidden, and unique things in the world around you." Niantic's first augmented reality game Ingress was initially made available on Android by invitation only in November 2012 then released publicly in October 2013. An iOS version was released in July 2014. Initially, Niantic had taken an alternative approach to monetization, veering away from more traditional mobile application development standards such as ad placements and in-app purchases. However, following the split with Google in 2015, in-app purchasing was implemented for Ingress. 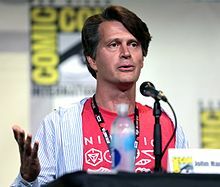 Founder and CEO John Hanke has noted that Ingress is a sort of proof of concept, adding that a next step could involve packaging application programming interfaces (APIs) from the Ingress application in order to entice developers. Companies that partnered with Niantic were marketed through the narrative of Ingress rather than direct marketing techniques. Some of those companies include Jamba Juice, Hint Water, Vodafone, Motorola, AXA, SoftBank Group, Mitsubishi UFJ Financial Group (MUFG), Lawson, Ito En, and Circle K.
In November 2018, Niantic released a thoroughly revamped version of the game branded as Ingress Prime. Prime is completely rewritten and Niantic used critical learnings gained from Pokémon GO and Ingress for its development. Niantic also retained the older Ingress game as a separate download named Scanner [REDACTED]. The intention of the older Ingress game is to help aid the transition to Prime as feature parity is reached between both games in 2019. Niantic's second announced (but currently unreleased) mobile game, Endgame, is a transmedia storytelling project consisting of an alternate reality game, Endgame: Ancient Truth, novels by James Frey starting with Endgame: The Calling, and the mobile app, Endgame: Proving Ground. In September 2015, it was announced that Niantic was developing Pokémon Go in partnership with Nintendo and The Pokémon Company for iOS and Android devices. The game was initially released in Australia, New Zealand, and the United States in July 2016 (and released to much of the rest of the world throughout the remainder of 2016), where it became an overnight global phenomenon, significantly increasing the use and visibility of augmented reality technology. In addition to topping app store charts in most regions, Apple Inc. announced that Pokémon Go had become the most downloaded app in a first week ever, which was topped by Super Mario Run later that year. Reports indicated that users were spending more time on Pokémon Go than on Facebook, Twitter, Snapchat, Tinder, and Instagram. In one month, Pokémon Go was downloaded more than 100 million times, with daily revenues exceeding $10 million. Exactly two months after its launch, at Apple's September keynote, John Hanke announced that Pokémon Go exceeded 500 million downloads worldwide and that players around the world had walked over 4.6 billion kilometers. By December, it was announced that the kilometer distance achieved in September had nearly doubled to over 8.7 billion kilometers, meaning that players had collectively walked further than the distance to Pluto. By the end of February 2017, Pokémon Go had surpassed over 650 million downloads. During Pokémon Go's Adventure Week in-game promo in May 2017, Niantic announced that players had collectively walked over 15.8 billion kilometers, roughly the distance from Earth past the edge of the solar system. On June 8, 2017, it was revealed that Pokémon Go had been downloaded over 750 million times globally. Like Ingress, Pokémon Go has a similar approach to monetization. The game has two main revenue streams, in-app purchases and regional partnerships. To date, Pokémon Go has established several partnerships around the globe among which include Sprint and Starbucks in the United States, Reliance Jio in India, and Unibail-Rodamco in Europe. In November 2017, it was announced that Niantic was developing Harry Potter: Wizards Unite in partnership with Warner Bros. Interactive Entertainment and WB Games San Francisco, under the Portkey Games banner. The game, inspired by J.K. Rowling's Wizarding World and Harry Potter, is said to allow players to "explore real-world neighbourhoods and cities to discover mysterious artifacts, learn to cast spells, and encounter legendary beasts and iconic characters along the way". It was announced that additional details would be revealed in 2018. ^ a b Markowitz, Eric (December 20, 2012). "Exclusive: Inside the Mind of Google's Greatest Idea Man, John Hanke". Inc.com. Retrieved June 19, 2015. ^ a b "About Niantic, Inc". Niantic. Retrieved December 11, 2018. ^ "Niantic's first AR game Ingress is getting a massive overhaul in 2018". The Verge. Retrieved April 16, 2018. ^ "Niantic Inc. Raises $20 Million in Financing from The Pokémon Company, Google and Nintendo". Niantic. October 15, 2015. Retrieved December 11, 2018. ^ Nutt, Christian. "Pokémon Go dev Niantic Labs scores another $5 million in funding". gamasutra.com. Retrieved July 7, 2016. ^ "Welcoming Gilman Louie, David Jones, Fuji TV, Cyan & Scott Banister, and Lucas Nealan to the Niantic Family". nianticlabs.com. Retrieved July 7, 2016. ^ "Feb 25, 2016: Niantic Labs - Funding Round - Series A | CrunchBase". www.crunchbase.com. Retrieved July 7, 2016. ^ "Niantic raises another $5m in Series A". Retrieved July 7, 2016. ^ Etherington, Darrell (November 24, 2017). "Pokémon Go creator raises $200 million ahead of Harry Potter game launch". TechCrunch. Retrieved November 25, 2017. ^ Gomez, Brandon (2019-01-16). "Niantic raises $245 million". www.cnbc.com. Retrieved 2019-01-18. ^ "The Niantic family is growing - Niantic". Niantic. Retrieved November 9, 2017. ^ Perez, Sarah. "Niantic acqui-hires Evertoon to add a social network to Pokémon Go and other apps". TechCrunch. Retrieved November 8, 2017. ^ Roettgers, Janko (February 1, 2018). "Pokemon Go Maker Niantic Acquires Startup That Develops Multiplayer Augmented Reality Tech". Variety. Retrieved February 2, 2018. ^ "Welcoming Matrix Mill to Niantic: Redefining How Machines See and Understand the World - Niantic". Niantic. Retrieved June 29, 2018. ^ "Welcoming Seismic Games to Niantic: Continuing to Shake Up How Games Are Made and Played - Niantic". Niantic. Retrieved July 18, 2018. ^ "A Peek Inside the Niantic Real World Platform". Niantic. Retrieved June 29, 2018. ^ "Niantic is opening its AR platform so others can make games like Pokémon Go". The Verge. Retrieved June 29, 2018. ^ "Field Trip". Field Trip. NianticLabs at Google. Retrieved December 11, 2018. ^ "Field Trip". iTunes Store. Apple. Retrieved December 11, 2018. ^ "Field Trip". Google Play. Google. Retrieved December 11, 2018. ^ Newton, Casey (December 13, 2013). "The everywhere arcade: How Google is turning location into a game platform". The Verge. ^ Holly, Russell (February 25, 2013). "Google makes Ingress codes available through HINT water partnership". GEEK. ^ Hanke, John (August 19, 2013). "Vodofone Germany Announcement". John Hanke Google+ Page. Archived from the original on March 27, 2016. ^ Niantic Labs, Inc. (August 1, 2013). "Ultra Strike Weapon Revealed - INGRESS REPORT - EP19". Ingress Youtube Page. ^ AXA Financial, Inc. (December 16, 2014). "AXA and Google's Niantic Labs Partner to Integrate 20,000 Global Retail Agencies into Ingress' Interactive'Real World' Mobile Gameplay Experience". AXA Press Release. Archived from the original on August 30, 2015. ^ Softbank Group, Corp. (July 27, 2015). "ソフトバンクショップがIngressに登場！". Softbank Press Release. ^ The Bank of Tokyo-Mitsubishi UFJ, Ltd. (June 20, 2015). "BTMU announces a partnership with "Ingress", using its vast network of branches and ATMs as portals in Japan!". MUFG Press Release. ^ Ito En, Ltd. (July 31, 2015). "スマートフォン用モバイルゲームアプリ「Ingress」（※）とコラボレーション". ITO EN Press Release. ^ "Welcome to Ingress Prime". Niantic. November 5, 2018. Retrieved December 11, 2018. ^ "Scanner [REDACTED]". Ingress Help Center. Retrieved December 11, 2018. ^ Frank, Blair Hanley. "Google's Niantic Labs merges another virtual world with reality in upcoming game". Geekwire.com. Geek Wire. Retrieved March 18, 2015. ^ Takahashi, Dean (December 17, 2014). "Google's Niantic Labs embarks on a giant interactive transmedia project with controversial author James Frey". Venture Beat. ^ Robertson, Adi (July 28, 2014). "Google is helping James Frey build a multimedia sci-fi juggernaut". The Verge. ^ Pokémon GO Press Conference. September 10, 2015 – via YouTube. ^ "Why Pokémon GO has been a viral success". Retrieved July 27, 2016. ^ "What Pokémon Go's Success Means for the Future of Augmented Reality". Fortune. July 23, 2016. Retrieved July 27, 2016. ^ Dillet, Romain. "Apple says Pokémon Go is the most downloaded app in a first week ever". TechCrunch. Retrieved July 27, 2016. ^ Hussain, Tamoor (December 23, 2016). "Super Mario Run Reaches 50 Million Downloads". GameSpot. Retrieved December 25, 2016. ^ Perez, Sarah. "Pokémon Go tops Twitter's daily users, sees more engagement than Facebook". TechCrunch. Retrieved July 27, 2016. ^ "5 Charts That Show Pokémon GO's Growth in the US". July 10, 2016. Retrieved July 27, 2016. ^ Perez, Sarah. "Pokémon Go passed 100 million installs over the weekend". TechCrunch. Retrieved August 5, 2016. ^ Grant, Christopher (September 7, 2016). "Pokémon Go has been downloaded 500 million times". Polygon. Retrieved March 1, 2017. ^ "200,000 trips around the Earth!". Niantic. Retrieved March 1, 2017. ^ Sarkar, Samit (February 27, 2017). "Pokémon Go hits 650 million downloads". Polygon. Retrieved March 1, 2017. ^ "Adventures Await! - Pokémon GO". Pokémon GO. Retrieved June 14, 2017. ^ "Celebrating the First Anniversary of Pokémon GO!". Pokémon GO. Retrieved June 14, 2017. ^ "Join us in welcoming Sprint as the first Pokémon GO United States partner". Niantic. Retrieved March 8, 2017. ^ "Hello, Starbucks!". Niantic. Retrieved March 8, 2017. ^ "Reliance Jio is now an official partner of Pokémon GO in India". Niantic. Retrieved March 8, 2017. ^ "Stay Warm While Playing Pokémon GO This Winter at Unibail-Rodamco Shopping Centers in Europe". Niantic. Retrieved March 8, 2017. ^ "The Magic of Harry Potter is coming to a Neighborhood Near You". Niantic. Retrieved November 8, 2017. ^ "Harry Potter : Wizards Unite". harrypotterwizardsunite.com. Retrieved November 9, 2017. ^ "NIANTIC, INC. AND WARNER BROS. INTERACTIVE ENTERTAINMENT ANNOUNCE PARTNERSHIP FOR HARRY POTTER: WIZARDS UNITE, AN AUGMENTED REALITY MOBILE GAME INSPIRED BY J.K. ROWLING'S WIZARDING WORLD". Niantic. Retrieved November 9, 2017.